There’s also a daylight lamp for diamond grading with sorting pad, and two bottles for immersion liquids. In addition, this portable laboratory is totally flexible in its power offering – running on mains power (110-230V), it has an automatic voltage switch capability; in the event of reduced or no mains power it will switch to its integral rechargeable battery. If required, the unit can also be connected to a 12V vehicle battery. For prices and availability information on Gem Travel Labs, please contact your nearest Krüss distributor, who will be delighted to help. For full technical specifications, please download the relevant datasheet here. You can find our Gem Travel Lab in the Gemmo-Shop! To ascertain the difference between synthetic, simulated, and real gems, away from the confines of the laboratory it is crucial for portable equipment to give the highest possible identification outcome. Appraisal in the field, at its very basic level, is carried out with a loupe, a flashlight, and a pair of tweezers. Not an ideal solution where identification is critical. Therefore, the use of portable high precision instruments will eliminate costly errors. As part of any portable kit, a stereo gem microscope is recommended – gem microscopes have special features not available on most microscopes. The higher the magnification, the better the view, and the greater detail provided will ensure positive identification. A refractometer should also be utilised – these units will give the refractive index, birefringence and optic sign. Although an optic sign can also be obtained from a polariscope, it can’t always be determined, so a refractometer should be used as an alternative. Polariscopes will determine if a material is singly or doubly refractive, as well as its optic sign. In addition, it will also show strain and twinning, which will aid identification in the difference between natural and man made materials. 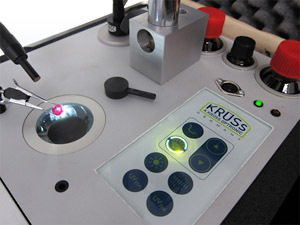 Professional gemmologists will incorporate a spectroscope in their portable equipment selection. There are two types, diffraction grating and prism. Each has their own advantage, however, with a prism spectroscope light is dispersed by passing through a series of prisms, and has the advantage that the spectrum is brighter, so faint lines are easier to view. Finally, lighting needs to be addressed in the field, with quality being key. Good lighting, such as daylight lamps and UV lights will often be built into equipment.